Attleboro, 63 vs. Durfee, 55 – Final – Durfee exploded for 25 points in the third quarter to take a 46-41 advantage into the final frame, but Attleboro had a response with 22 fourth-quarter points to pull away. Sophomore Qualeem Charles scored 14 of his team-high 20 points in the second half and hauled in 16 rebounds to pace the Bombardiers while classmate Tim Callahan hit four three-pointers, including two in the fourth quarter, on his way to a career-high 17 points. Foxboro, 59 vs. Walpole, 40 – Final – Sophomore Will Morrison scored a career-high 11 points as Foxboro ended its season by earning its 18th victory. Seniors Teddy Maher and Matt Rongione also added 11 points apiece while Anthony Mollica chipped in with nine points. King Philip, 51 vs. Dartmouth, 50 – Final (OT) – King Philip’s defense held Dartmouth to just six points in the fourth quarter to help force overtime. Pharoah Davis scored half of his eight points in the fourth quarter and the other half in the overtime period to help the Warriors end the season with a win. Bruce Santillus scored seven of his team-high 13 points in the opening quarter and was named to the all-tournament team. Senior Tom Madden added 12 points, including nine in the third quarter. Milford, 46 vs. Dedham, 31 – Final – Click here for a recap of this game. 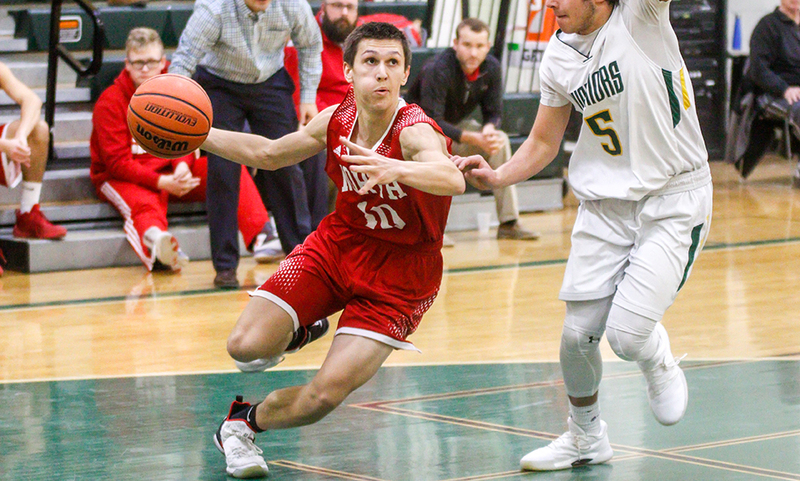 North Attleboro, 48 @ Bishop Feehan, 30 – Final – North Attleboro limited the Shamrocks to just five points in the second quarter and then just one free throw in the third to finish its season on a winning note. The Rocketeers led 24-16 at halftime and then took a 35-17 advantage into the fourth. Junior Jake Petersen recorded 17 points and 10 rebounds while classmate Josh Montague chipped in with nine points. North finishes the season 9-11. Attleboro, 43 @ Durfee, 49 – Final – Attleboro rallied from 18 down entering the fourth quarter and cut the lead to as little as four points, but could not get the road win in the season finale. Sam Pierce led the way with 20 points and Kim White added nine for the Bombardiers. Mansfield, 50 vs. Lowell, 48 – Final – Click here for a Recap from this game. North Attleboro, 42 vs. Bishop Feehan, 61 – Final – Emily Haskell scored a team-high 14 points for the Rocketeers. Franklin, 3 @ Barnstable, 2 – Final (OT) – Joe Lizotte scored the game-winner in overtime to send Franklin to the final of the Barnstable tournament to face Marshfield. The game counts as a 2-2 tie for MIAA seeding purposes. Brendan O’Rielly and Jack McGrath also scored for the Panthers. Mansfield, 2 vs. Bridgewater-Raynham, 1 – Final – Mansfield junior Chris Copponi help set up a pair of second period goals to lift the Hornets over the Trojans. Chris Copponi and senior Patrick McCafferty set up freshman Matt Copponi’s power play goal at 9:11. The Copponi brothers then combined to assist on junior Coleman O’Brien tally at 5:25 of the period. Canton, 2 @ Walpole, 1 – Final – Canton junior Maggie Malloy assisted on both of the Bulldogs’ goals, giving the visitors a win to close out the regular season. Malloy set up Lauren Fitzpatrick and Lizzie Tassinari for the goals. WRENTHAM, Mass. – In a back and forth battle between King Philip and North Attleboro, it was the visiting Rocketeers that landed the biggest blow of the game, rallying over the final five minutes to earn a 55-51 decision over the Warriors. While the first half was a see-saw type game, featuring four lead changes and four ties, King Philip was in control for the majority of the second half. The Warriors led by as much as 10 points early in the third quarter only for North to get within four heading into the final frame. The hosts extended their lead to seven with five minutes to go in the game, but KP’s offense went cold from there. North finished the game on a 12-1 run, rattling off eight straight to take its first lead of the second half with two minutes to go. Big Red tacked on a big three and a key free throw to go up by four in the final minute. “I thought our kids worked really, really hard,” said North Attleboro head coach Sean Mulkerrins. “In the first half, [King Philip’s] screens were bothering us, which they shouldn’t have. Some guys had some miscommunications, some breakdowns. And then at times, it was giving up open shots. You give KP a lot of credit because they put us in a lot of tough spots but give our kids a lot of credit to finish the game the way they finished and make just enough plays to get out of here with a win. Rocketeers junior Josh Montague (25 points, four assists) scored on back-to-back drives to open the final quarter, tying the game at 43-43. King Philip responded with a 7-0 run with a bucket from Kyle Layman (14 points, eight rebounds, three assists) down low, a three from Tim Nault (career-high 13 points) and a pair of free throws from Bruce Santillus. King Philip led 50-43 with just over five minutes to play. That’s when North went on its run. Junior Matt Seavey (six points, five rebounds) converted a putback, junior Jake Petersen scored an easy bucket after a strong drive and dish from Montague, Nate Gonsalves (seven points) came up with a huge steal that led to two points from Montague, and then Gonsalves beat the shot clock buzzer with a deep two, giving the Rocketeers a 51-50 lead with two minutes to play. King Philip looked to answer but Gonsalves came up with yet another big defensive play, blocking a shot at the free throw line. The Warriors had another chance on the play but couldn’t get their three-point to fall. Meanwhile, on the other end, Gonsalves wasn’t lacking any confidence when he launched a deep three from straight away, sinking the shot with a minute to go to put North up 54-50. The Warriors missed on the other end but got the ball back with a North turnover. Pharoah Davis (15 points) sank one free throw to get within three. Montague sank a free throw of his own with 13 seconds to play, icing the win for the Rocketeers. King Philip led 28-24 at the half-time break and came up with a quick 8-2 burst to take its largest lead of the game. A strong move from Davis, a jumper from Nault, a nice post move from Layman and a layup from Davis helped the Warriors build a 36-26 lead. But Montague spearheaded an 11-3 run from the visitors, hitting a pair of threes in the stretch while both Ethan Friberg and Seavey scored down low to bring North within two at 39-37. North Attleboro built an early 9-5 lead but five straight from Davis put the hosts in front. Junior Owen Nassaney (seven points) came off the bench and scored four straight of his own to give the Rocketeers the 13-10 edge after one. Nassaney started the second quarter with a bang. Gonsalves came up with a steal, tossing it ahead to Nassaney for a two-handed dunk while being fouled. He made the free throw for a 16-10 lead. King Philip responded with an 8-2 run of its own with two from Layman, a free throw from Tom Madden, a bucket from Davis, a triple from Nault and another layup from Davis for a 20-18 lead. Montague tied the game at 20-20 but King Philip won the final tow minutes 8-4, including threes from Nault and Nolan Bradley. The Warriors won the rebounding battle (30-27) but had 14 turnovers and shot 38% from the field. North Attleboro boys basketball (5-6 Hockomock, 7-6 overall) is back in action on Friday when it resumes play against division foes with a road trip to Canton at 5:00. King Philip (2-9, 2-11) will try to snap its current skip when it hosts Attleboro on Friday at 7:00. Franklin, 76 @ Attleboro, 72 – Final (OT) – Franklin erased a five-point deficit over the final 90 seconds to send the game into overtime and then outscored the Bombardiers 8-4 in the final period to earn the win. Paul Mahon hit the tying three with less than a minute to play and then hit another triple early in overtime to put Franklin up 73-68. Jalen Samuels poured in a career-high 28 points along with 17 rebounds to lead the Panthers. Samuels scored eight of his points between the fourth and overtime. Sophomore Chris Edgehill added 20 points for Franklin. For Attleboro, sophomore Bryant Ciccio had a career-high 19 points, including 11 points in the fourth quarter to help the Bombardiers build a lead. Kevin Velazquez added a career-best 14 points while sophomore Qualeem Charles had 13 points and 11 rebounds. Foxboro 48 @ Canton, 61 – Final – Click here for a recap of this game. 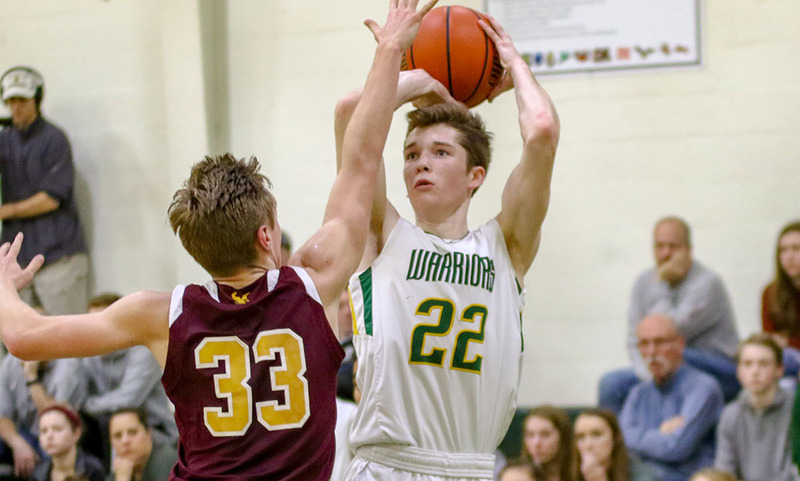 Mansfield, 73 @ King Philip, 54 – Final – After leading by just three at the half (34-31), Mansfield outscored the Warriors by eight in the third and then dropped 21 points in the final quarter to pick up a division win. Senior John McCoy paced the Hornets with 20 points and seven rebounds while Khristian Conner dropped 16 points. Sam Hyland added 12 points, six rebounds and three assists for the Hornets. KP’s Bruce Santillus scored a career-high 17 points. Milford, 49 @ North Attleboro, 36 – Final – North Attleboro limited Milford to just 14 points at halftime, but could only score 16 of its own. The Scarlet Hawks offense came alive in the second half, outscoring North 35-20. Junior Brendan White scored nine of his game-high 16 points in the third quarter while Kayden Kelley had 10 points and 13 rebounds and Andrew Fraioli finished with nine points and nine rebounds. North Attleboro junior Josh Montague led the Rocketeers with 12 points. Oliver Ames, 60 @ Taunton, 61 – Final – Taunton sophomore Dante Law hit a deep, contested three with just three seconds left to help Taunton earn a 61-60 decision over Oliver Ames. OA took the lead on a bucket from junior Ethan Eckstrom with 20 seconds left before Law hit the game-winner. OA held a 57-51 lead with five minutes to play but Taunton used a 7-1 run to tie the game. Taunton senior Lens Esquil had a game-high 19 points while junior John Martins had a career-high 13 points, including a trio of three-pointers in the second half. Law and Malik Charles each had 10 points. Jack Spillane led OA with 20 points while Matt Muir scored a career-high 16 points for the visitors. Sharon, 65 @ Stoughton, 91 – Final – Stoughton connected on 16 three-pointers en route to its best offensive performance of the season. Senior Cam Andrews scored 26 points (five three-pointers) while classmate Colin Sanda (five three-pointers) added a career-high 17 points and sophomore Ajahn Rue (four three-pointers) had a career-high 18 points, seven assists, and seven steals. Malik Loruqet led the Eagles with 20 points. Attleboro, 51 @ Franklin, 63 – Final – Click here for a Recap and Photo Gallery from this game. Canton, 34 @ Foxboro, 79 – Final – Ashley Sampson poured in 28 points as Foxboro continued its unbeaten start in the league. Lily Sykes added 15 points and Katelyn Mollica had 11 for the Warriors. King Philip, 28 @ Mansfield, 53 – Final – Meg Hill recorded another double-double with 18 points and 11 rebounds and also had four blocks. Ann Maher scored nine points and Maggie Danehy and Emily Vigeant each had seven for Mansfield. KP was led by Catherine Cummings with 11 points, while Faith Roy chipped in with five. North Attleboro, 41 @ Milford, 51 – Final – Kate Irwin scored 19 points for the Hawks, who move back into a second-place tie in the Davenport. Emily Piergustavo added 13 points for Milford. Taunton, 22 @ Oliver Ames, 66 – Final – Oliver Ames jumped out to a 32-18 lead at halftime and put on a dominant second-half performance to earn the win. OA senior Kayla Raymond continued her strong play with 28 points, five rebounds, and five steals while Ally Scolnick added 11 points in the win. OA head coach Laney Holbrook noted sophomore Erin Holmberg played great defense for the host Tigers. Stoughton, 45 @ Sharon, 36 – Final – Stoughton junior Hailey Egan dropped a career-best 14 points to lead the Black Knights to a division win on the road at Sharon. Senior Val Whalen added a team-high 13 rebounds while freshman Sydnee Hyacinthe had a game-high five steals for the Black Knights. Attleboro @ Oliver Ames – Ppd. to 1/14 at 5:00. Canton, 56 @ Sharon, 42 – Final – Sharon built a double-digit lead in the first quarter but Canton rallied in the second to take a lead and never looked back. The Bulldogs trailed 20-9 in the first but took a 28-23 lead into the locker room at halftime. Canton closed the game with strong defense, allowing just seven points in the fourth quarter. Junior Devin Foster scored 18 points for the Bulldogs while senior Tony Harris had nine points and nine rebounds. Sharon senior Malik Lorquet scored a game-high 20 points and hauled in 15 rebounds. Milford, 51 @ Foxboro, 55 – Final – Click here for a recap of this game. Mansfield, 52 @ Franklin, 67 – Final – Click here for a recap of this game. King Philip, 70 @ Taunton, 72 – Final – King Philip rallied from a 14-point deficit in the fourth quarter with a chance to tie or win late, but the Tigers survived. Senior Lens Esquil had a team-high 17 points while sophomore Dante Law added 12 points and senior Tyler Medeiros finished with 10 points. For King Philip, senior Pharoah Davis had 18 points while Bruce Santillus added 15 points and 11 rebounds. North Attleboro, 68 @ Stoughton, 60 – Final – North Attleboro junior Jake Petersen poured in a career-high 26 points, hauled in 11 rebounds (six offensive) and had three blocks to lead the Rocketeers to a win. Stoughton took a lead in the fourth quarter with a 5-0 run (50-49), but North Attleboro outscored the Black Knights 19-10 the rest of the way, pulling away in the final minutes. Petersen scored 12 of his points in the second quarter and added eight more in the final frame. Junior Josh Montague added 17 points while classmate Matt Seavey added nine points and nine rebounds off the bench. Stoughton senior Cam Andrews poured in 29 points (four three-pointers) while Colin Sanda added 14 points (four three-pointers). Oliver Ames, 67 @ Attleboro, 54 – Final – Kayla Raymond scored a career-high 38 points, her second straight game with at least 30 points, to pace the Tigers to a road win. Raymond also had 11 rebounds while Abby Reardon added 10 points, six rebounds and five assists and Alex Sheldon chipped in with nine points and six boards for OA. Sam Pierce had 18 for the Bombardiers and Liv McCall added 16 in the loss. Before the game, Attleboro honored Sarah Deyo, who became the program’s all-time leading scorer last year and is currently playing at Southern New Hampshire University. Sharon, 44 @ Canton, 49 – Final – Maggie Connolly scored 14 points to lead the Bulldogs to a 5-2 start to the season. Erin Devine and Hannah Jerrier each had 10 points and Julia Hamilton had six in the win, which was hard-fought for Canton. The Bulldogs led 33-14 at the half, but the Eagles outscored them 30-16 to make it a close finish. Telishya Herbert was Sharon’s top scorer with 13 and Emma Eberhardt added 12. Foxboro, 67 @ Milford, 47 – Final – Lily Sykes was the top scorer for Foxboro with 17 points, while Grace Tamulionis had 16 and Ashley Sampson had 15 points for the Warriors. 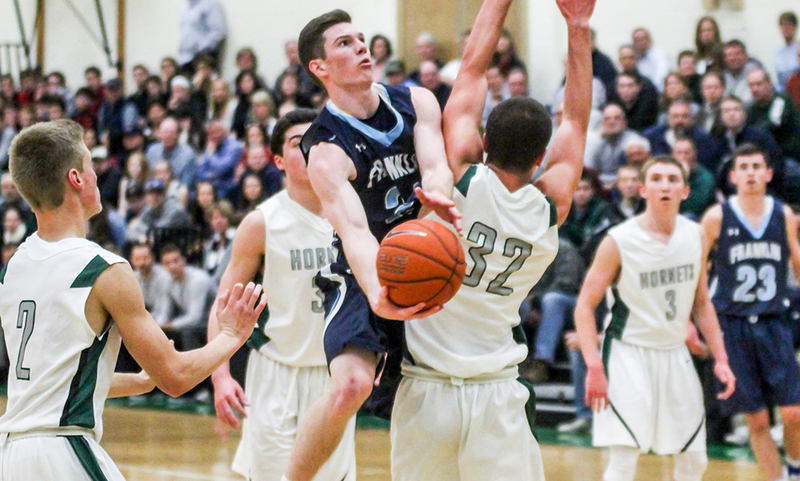 Franklin, 49 @ Holy Name, 42 – Final – Franklin went to Worcester and picked up a season sweep against Holy Name. After hitting two clutch free throws that forced overtime in the first meeting with the Naps, freshman Elizabeth Wilson scored 20 points to lead the Panthers. Taunton, 64 @ King Philip, 62 – Final (OT) – The Tigers edged KP 10-8 in overtime after finishing regulation 54-54. Lily Patneaude led Taunton with 16 points and five rebounds and MacKenzie Handrahan chipped in with 15 points and nine boards. Kelsey White had a great overall night for the Tigers with 12 points, nine rebounds, and five assists, and Hannah Moniz had 11 in the win. Stoughton, 59 @ North Attleboro, 43 – Final – Click here for a recap and photo gallery from this game. Attleboro will be looking to its youth to try and get back to the state tournament this season. With just two seniors and four juniors, half of the Bombardiers’ roster is made up of underclassman. But just because the Bombardiers are young, doesn’t mean they aren’t experienced. Senior Nate Douglas, a returning starter, has been getting minutes on varsity since his freshman year, and classmate Elvin Sam emerged as a reliable shooter off the bench last season. Sophomores Qualeem Charles and Bryant Ciccio made big impacts during their rookie campaigns last season. Charles (6’5) will be a big presence in the post while Ciccio will be one of the primary ball handlers. Charles will be joined by sophomore Jason Weir (6’2) in the post while junior forward Dom Victor will be a game-changer on both ends of the floor. At 6’4, his athleticism will cause a lot of matchup problems for opposing defenses. Douglas and Ciccio will be joined by Mason Houle, Kevin Velazquez and Tim Callahan in the backcourt. The goal is pretty clear for Canton this season. Not only do the Bulldogs want to reach the postseason for the first time since 2014, they want to compete for the Davenport division title. With two of the top players back in the lineup, both goals are reasonable. Senior Tony Harris and junior Devin Foster, both HockomockSports.com Third Team selections a year ago, return to anchor a Bulldogs’ team that just missed out on the playoffs last year. They’ll be joined by Austin Maffie and Jake Verille, both returning starters, as well as Paul Corcoran, Kyle Fitzgerald and Ryan Lentol, who all have varsity experience. Harris and Foster give Canton an immediate edge on offense with two talented scorers, but it will be important for others to step up and make plays all season long. On defense, the Bulldogs will rely on their quickness to try and bother teams. The mantra “Defense Wins Championships” has been proven in many different sports, at many different levels. The 2017-2018 Foxboro Warriors are hoping that will be the case this season. It helps that Foxboro returns the reigning HockomockSports.com Defensive Player of the Year in senior Joe Morrison. As a junior, Morrison routinely limited opponents’ best offensive player, and was a big reason why the Warriors allowed just 55.9 points per game. Sophomore Brandon Borde returns to the starting lineup alongside Morrison. Borde had a strong freshman season and will likely see his role increase this year, especially on the offensive end of the court. Seniors Teddy Maher and Matt Rognione, both with plenty of varsity experience will both see plenty of time this year and will be relied upon to make plays. After making it to the Division 1 State Final a year ago, the Panthers are hoping to be just as competitive this season. With three starters back, and a handful of experienced and talented bench players, the expectations for Franklin are certainly high. Losing Josh Macchi to graduation will hurt, but the Panthers return their best player in senior Paul Mahon, along with two terrific young talents in junior Jalen Samuels and sophomore Chris Edgehill. When playing at his best, Samuels’ athleticism and offensive skills make him one of the toughest marks in the league. Edgehill really turned it on in the tournament and if he can sustain that level of play throughout the regular season, the Panthers will be a favorite for the league title. Seniors Alex Klowan, Matt Elias, Jack Rodgers and Gavin Farnan all picked up valuable minutes a season ago and will be key pieces for the Panthers, whether its apart of the starting line up for coming off the bench. Having so many experienced players ready to come off the bench should give Franklin the upper hand on a lot of teams. After losing just three seniors that played valuable minutes last season, and a full season complete under head coach Mark Champagne, King Philip is looking to take the next step this year and get back to the postseason. The biggest shoes to fill are those left by Seth Sullivan and Will Weir, but the Warriors have five players back that either started or saw significant varsity minutes a season ago for a team that was just a couple games away from making the playoffs. Not only were they just a couple of games off, they were competitive in almost every game, including a three-point loss to Attleboro, a one-point loss to Taunton, and a three-point loss to Mansfield in a four-game span. Seniors Tom Madden, Pharoah Davis, and Nolan Bradley are all back this season, along with juniors Kyle Layman and Bruce Santillus. Layman and Madden (both 6’4) will give the Warriors size in the frontcourt while Davis, one of the most experienced players in the league, will be the premier ball handler. Bradley provides King Philip with a threat from beyond the three-point line and Santillus showed this offseason the ability to fill the scoresheet up. This might be the most turnover we’ve seen the Hornets have in quite some time, but just because there will be a lot of new faces doesn’t meet much will change for the Hornets. Expectations are still sky high, as Mansfield will be looking to compete for another Kelley-Rex title (Mansfield has won five straight division titles). And when it comes to the postseason, the Hornets are aiming to get back to at least the spot they got to last year – the D1 South Final – with aspirations to go further. All six seniors that graduated all played important roles over the past couple of years for the Hornets, including last year’s HockomockSports.com Player of the Year Sam Goldberg. However, Mansfield does bring back experience in Tyler Boulter, John McCoy, Ryan Otto and Sam Hyland. Senior Nick Ferraz will give Mansfield some depth in the frontcourt after missing last year to injury, and senior transfer Justin Vine gives the Hornets another shooting option. Junior Damani Scott showed glimpses at the end of last when he was called up while Khristian Conner and Tommy Dooling should see increased roles this season. Although the Hawks graduated three of their top scorers from last year, expectations are still high in Milford. It will be tough to replace the offensive output of Zack Tamagni, Anthony Arcudi, and Nate Davila, but the Hawks will be relying on their size this season to get the offense going. Senior Kayden Kelley is back for his third year starting on varsity and will be an important piece on both ends for Milford. Standing at 6’4, Kelley is a tough matchup and is one of the best rebounders in the league. He averaged 14.3 boards per game a year ago and led the league in double-doubles. Senior Shane Cosquete will start at point guard again this year, and will be relied upon on to set the offense in motion. He will likely be relied upon for more scoring this season. Junior Brendan White will join the starting lineup after coming off the bench in 23 years ago. A physical presence, White brings energy and defensive toughness to the lineup. Transfers Andew Fraioli (6’5) and Joey Everett (6’3) give the Hawks depth in the frontcourt. “We’ve improved statistically offensively and defensively over each of the past three seasons and that’s a trend that we will be hoping to continue here in 2017-2018,” said Milford head coach Paul Seaver. It’s no surprise that after graduating four starters, and the team’s sixth man that it will be a youth revolution in Big Red Country. Starters Brent Doherty, Johnny Friberg, Kyle McCarthy and Tommy Reynolds are gone, as well as Moni Cuevas, who played plenty of minutes off the bench. The one returning starter is senior Chad Peterson, a familiar face in the Rocketeers’ lineup since his freshman year. And all four of the other returning players – senior Derek Shanks and juniors Matt Seavey, Josh Montague and Nate Gonsalves – all saw plenty of minutes last season. While Peterson will likely take on a leadership role and see increased point production, expect Montague to emerge as a leading scorer for the Rocketeers. Shanks can stretch the floor some and hit mid-range jumpers, Seavey is a solid option in the post, and Gonsalves is a capable ball handler. Offensive, North will rely on its size. On top of Seavey and Shanks, the Rocketeers have a pair of 6’6 forwards in Jacob Petersen and Owen Nassaney to add depth and size to the frontcourt. Junior Jonathan James, recovering from a football injury, will likely factor in as well. Oliver Ames surpassed most expectations in its first year in the Kelley-Rex division, coming in third and opening the playoffs with a road win at Milton. But the toughest part about the Kelley-Rex is that the challenge gets harder and harder every year. And with Oliver Ames losing three starters – Carter Evin, Nick Welch, and Dylan Mahoney – to graduation, the Tigers will be facing an uphill battle. The good news is that the Tigers have seniors Jack Spillane and Matt Muir back this year. Both were starters a year ago, and Spillane showed the ability to really fill up the stat sheet, scoring 25 points or more on three occasions. Junior Ethan Eckstrom, a center, will see more minutes this season and his size will be key to helping defend opposing teams. Senior Noah Fitzgerald showed last year how much of a pest he can be on the defensive side of the ball, and the Tigers will rely on him to do so again this year. Junior Jake Erlich earned his way into the lineup and picked up valuable experience last season. He will likely see an increased role this season and his strength help the Tigers in the post. It will be tough to replace Ricardo Ripley at point guard, but the good news for Sharon is that the majority of the Eagles that played valuable minutes last year as returning this season. 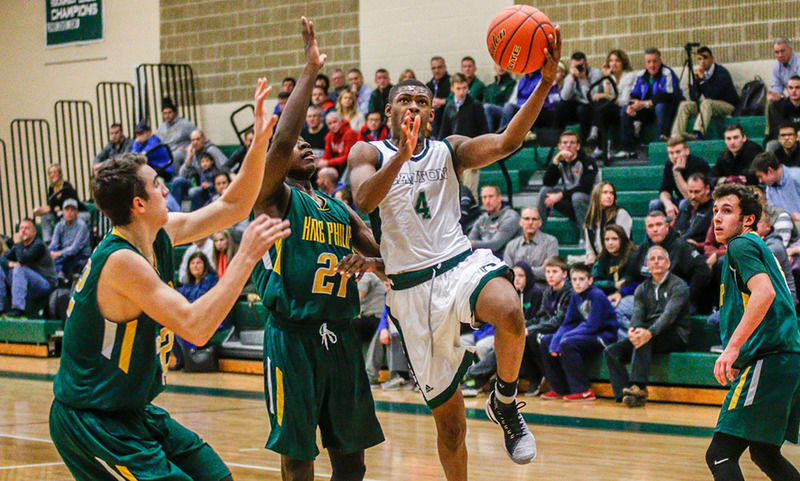 Senior Malik Lorquet broke out of his shell last year and showed that he can take over a game. Now a senior, Lorquet will be a focal point on both sides of the court for the Eagles. Senior Jimmy Fitzhenry can catch fire at any moment, and when he does, he is one of the most dangerous shooters in the league. Alex Kaufmann also showed glimpses last year as a sophomore, both as a ball handler and a scorer. Between him, Lorquet and Fitzhenry, the Eagles have a solid offensive core to rely on. Jayvon Monteiro is one of the most passionate players in the league and will see an increased role at guard and be key to Sharon’s defense. Aidan Kane, Ben Kaplan, and Aaron Strong will all be important players off the bench for Sharon. Stoughton will be looking to improve on last year’s season, and the best way to do that will be to improve on the defensive end of the court. The Black Knights haven’t had too much trouble on the offensive end, and with leading scoring Cam Andrews back for his senior year, it likely won’t be a big issue this year either. But the Knights have allowed a league-high in points each of the last two seasons. Andrews led the Hockomock League in scoring last year with 17.8 points per game and will demand the attention of opposing defenses. Senior Colin Sanda can also hit from the outside and will be a solid second option for the Black Knights, who graduated eight players including reliable scoring options Cam Gomes and Matthew Valle. In the frontcourt, junior David Bell (6’2) showed some potential at the end of last year and should factor in more in 2017-2018. 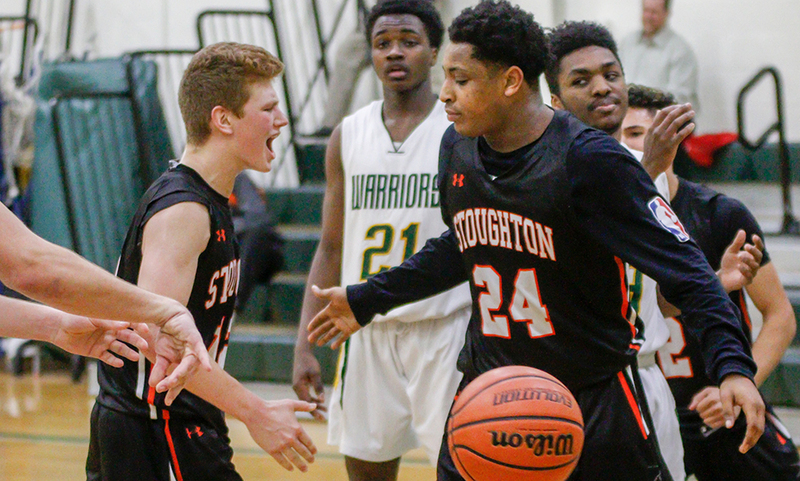 “Offensively we may create problems for some teams but our defense has to be better than it has been in the recent past,” said Stoughton head coach John Gallivan. When it comes to pace, Taunton is hoping to be among the fastest teams in the league this season. The Tigers will still be young this year, but not as much as last year with plenty of young players returning after gaining experience last season. Seniors Lens Esquil and Malik Charles both played last year and have shown improvement in their skills; they’ll be relied upon to be team leaders this season. Sophomore Dante Law had a tremendous freshman season, and hurt a lot of teams in a lot of ways. Whether it was from deep, like his six three pointers against Foxboro, or his ability to attack the basket, he’s one of the most dangerous young players in the league. Junior Lou Vendrell also emerged as a top scorer last season and could be one of the top shooters in the league this year. Junior John Martins is another experienced player that is capable of scoring while Diamond Blakely and Prince Brown will share point guard duties. Naz Kenian, Tyler Medeiros, and Wesner Charles are all going to be options for head coach Charlie Dacey as well.